What could be more important to business growth than strong management and leadership excellence? That’s why the Ulster Business School is nailing its colours to the mast with the announcement of its new Department of Management and Leadership. Launched at a high profile conference in Belfast headlined by international business leader Sir Christopher Bland, Ulster’s Department of Management and Leadership brings the finest minds in management and leadership education in Northern Ireland to focus on creating the new business leaders of tomorrow. In addition to educating the next generation of business leaders, the new Department also forms a skills resource for existing business. Its academics and researchers have a wealth of world-wide experience and strong international expert networks that they can bring to bear on management issues facing Northern Ireland’s business community. Many of the Department’s students – especially at MBA level – are already employed in business, and the focus is on equipping them with the ability to take their businesses and careers forward to the next level, says Mrs Farley. “The skills we teach are broad based: every business needs management, every business needs leadership. But we also target our offer to the needs of particular target markets –some explicitly designed for senior managers and executives, others like the Masters in Business Studies (MBS), are tailored for graduates coming from a wide range of backgrounds, often from specialist fields such as engineering or other disciplines. Business education at Ulster has a track record of success over its 30 year history of engagement with Northern Ireland’s commercial environment. As one entrepreneur, businessman and trained engineer Michael Ludlow chose the Ulster Business School to acquire the management and leadership savoir-faire he needed to build his business. “It’s the best thing I ever did,” he said. Today, Michael’s aerospace company Lenis Aer, stands on the brink of international success, having won both the £25K award and the InterTradeIreland Seedcorn award for its revolutionary aero engine nacelle technology. Michael has also recently been appointed as a Visiting Professor to the Department. 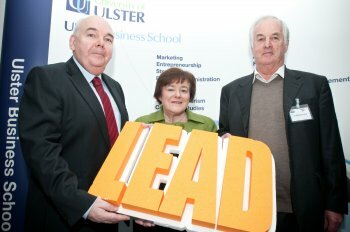 Caption: Bill Manson of Podiem, Professor Marie McHugh and Sir Christopher Bland at the management and leadership conference in the University of Ulster's Belfast campus.